I have a really clear memory of dropping in on a trio set with Paul Bley, Gary Peacock and Paul Motian while passing through New York when I was 17 or so. It was Motian who struck me the most: on one tune — and I can see this clearly in my mind 12 years later — all he played was his ride cymbal. 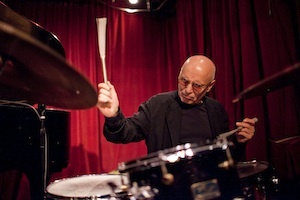 After the tune ended, a guy in front of me leaned in towards his date and said: “only Paul Motian could pull that off”, and that was really my first clear realization of that most mysterious element of music, the ability that great musicians have to infuse the tiniest thing — a single cymbal hit, for example — with layers of meaning. How is that even possible? It’s just a cymbal hit, after all. But Paul was staring so hard at the cymbal, and his concentration was clearly so intense, that somehow it didn’t sound like a cymbal but like some kind of personal expression, like a smile, a raised eyebrow or a laugh. Paul was one of the rare players who never sound like they’re playing notes — it goes straight past craft into expression, past “music” (in the non-transcendent sense) into “art”. How Paul did that I have no idea, but he must be one of the all-time masters of that brand of magic. After I moved to New York, in 2006, he was probably the musician that I went to hear the most, and he never disappointed. Most of the time he played incredibly beautifully (always in his singular, faux-naïf way), then occasionally he seemed not to be enjoying the gig and it got really interesting: it looked and sounded to me like he would choose to express his frustration in music instead of keeping it inside, allowing himself at these times to play loudly and at first glance anti-musically. Except it was always musical: in fact I saw several examples of his approach turning a set that was sagging into something genuinely riveting, as it awakened everybody onstage and put them into some kind of heightened combat mode. Sometimes the other players refused to be awakened, but Paul charged on regardless. He always seemed to be asking: how can we make some compelling music out of this situation? There’s no doubt that he was acutely aware that the greatest sin in art is boredom. Vitality was always at the forefront, and surrender to blandness just wasn’t an option. He would go down swinging. I always thought of Paul as a master of casting: his bands seemed, to me, to be put together the way a director chooses actors for a movie: the goal wasn’t just to get the best musicians, but to gather a complete array of characters that would contrast and bring unexpected things out of each other. Like a movie: if you have a hero, you need a villain; if you have a class nerd, you need a class clown. Once he put a band together for a week at the Vanguard that included a young musician who in the ears of some listeners wasn’t pulling his weight. Asked why he had hired him, Paul said: “he sounds so bad, he makes me sound great!” Not many people in jazz think along these lines — the drama that comes from the internal dynamic of the band, the interactions of its various characters. It reminds me of Miles telling Dave Liebman, as he asked why he was in the band, that the “audience liked to see him move his fingers fast”. Paul was always aiming for something that was greater than the sum of its parts. I got to play with Paul on two occasions: a quartet week with Lee Konitz at Birdland in July 2009, and a duo night at Cornelia Street Cafe in February 2011. Paul even called me this summer to ask if I could do a trio week at the Vanguard, but it’s one of the tragedies of my musical life that this — my dream gig — isn’t going to happen now. I am deeply grateful, though, for the duo night at Cornelia St, easily one of the musical highlights of my life so far. I approached the gig with no expectations, knowing that if Paul wasn’t digging the music, he wouldn’t pretend otherwise. We played a couple Monk tunes and a couple standards, but mostly we played free. Paul was clear that the music shouldn’t be recorded, and I complied. A few months later, though, a friend surprised me with a bootleg she had made from the audience. I’m very glad to have this now, because it’s a reminder that Paul — and this is something I’ll always be proud of — dug the music. He was generous, giving, incredibly attentive, committed to making music together. I was suddenly struck by the miraculous nature of Paul’s time. There’s no other way to describe it. It was perfect — accurate, constant, deeply grooving — and profoundly flexible at the same time. It was immediately something that you could trust, a bedrock. Somehow this fact — the exquisiteness of Paul’s sense of time — had slipped me by until then, perhaps because the duo format, with its inherent fragility, the tightrope walk of two instruments without a third as consensus-builder, leaves so much open space that you have to notice these things. Or maybe I just wasn’t ready to really appreciate it before. A couple weeks after our duo gig, I went to hear Paul at the Vanguard. After the set, he said “hey, that was a fun gig! We should do it again sometime”, and I couldn’t believe my luck. That’s the thing with people who speak their mind: when they say something nice, you know it actually means something. I only wish we had had the time to actually do it again — like everyone else, I was shocked to see him go. He really seemed like he would go on forever. From the week at Birdland with Lee, I remember being struck by Paul’s endings. It was like that Nietzsche quote: “Masters of the first rank are revealed by the fact that in great as well as small matters they know how to end perfectly, whether it is a matter of ending a melody or a thought”. His endings just happened, often unexpected and always just right. One thing I noticed about Paul is that you could bring just about anyone to a gig of his, including self-proclaimed jazz haters, and they would love him. I experienced this 4 or 5 times. There was something obviously universal about him, like Monk, that people — almost everyone — couldn’t help responding to. The phrase “I don’t usually like drummers, but he’s amazing!” kept coming back. If you’re talking about pure music, he was it. In the end, when I think of Paul, the first word that comes to me is ‘truth’. In his way of playing music, and generally in his way of being, with pretending not ever being an option, he exemplified truth. I think that’s why people couldn’t help loving him: truth cuts across all cultures and religions; we know it when we see it. To see such a consistent source of truth disappear from the world is hard to bear. The second word that comes to me is “badass”. Damn that guy was cool! Gary Peacock said a couple things about Paul when we were playing together this summer. “He just takes the sticks and plays” was the first thing, which is pretty fitting coming from the devoted Zen practitioner that Gary is: there just didn’t seem to be anything in the way between Paul and the music, or life for that matter. He exemplified the “eat when you’re hungry, sleep when you’re tired” ethos of Zen. Then Gary told a story. Towards the end of a tour that he and Paul were doing with Bill Evans in the Trio 64 era, Paul went up to Bill one night and told him that he would be leaving the next day. 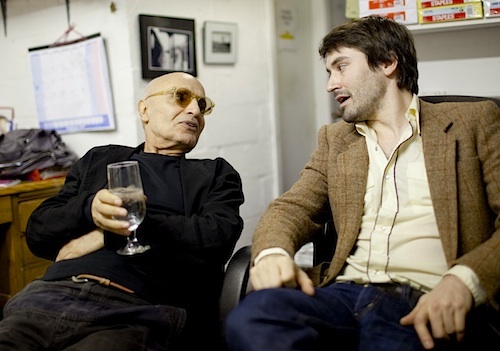 Bill said: “but Paul, we still have three nights left in the tour!” Paul answered that he understood, but that he really had to go to New York to play with Paul Bley — that that was the music he felt he needed to play. And here’s the amazing thing: according to Gary, Paul was so honest and straightforward, that very soon Evans was coming around to his side. Only Paul could make an abrupt breakup come across as something other than a betrayal. It was just what he had to do, and that was that. It’s hard to fight the truth. This entry was posted in Music and tagged music, Paul Motian. Bookmark the permalink. This is wonderful, Dan. Many thanks for posting it. “He would go down swinging.” Beautiful.